Kudat Long House Tour, Day Tour In Malaysia. 0730hrs a willing long journey will bring you a cultural tour that takes you to North through Kota Belud, the place been known a home to Bajau Horse Men in old day. Pay visit to very well known traditional “Tamu” market (if the tour fall on Sunday). Kudat located on the most Northern part of Sabah. One of the place where the Rungus maintain their Long House lifestyle and traditions. The life here revolves mainly around their rice planting and their handicrafts –basketry, beadwork and cloth weaving. Rungus women still use a blackstrap handloom to weave their traditional attire made of cotton which they grow themselves. 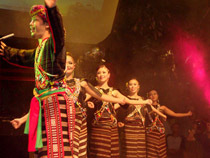 Their dress is one of the most attractive among Sabah’s ethnic group. You will have a chance to visit one of the longhouse and visit a village who run a cottage industries include bee farming and gong making. Another Kudat’s attraction is Simpang Mengayau – The most Northern Tip of Borneo – which looks out over the collision of South China Sea and Sulu Sea.. Pick up from hotel in Kota Kinabalu and drive north to Kudat. Villages, rice field and nice scenery can be seen along the way. 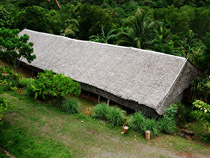 Visit a traditional long house in a village just outside Kudat. Observe the way of life, the dress and the living quarters of the Rungus tribe. Return to Kota Kinabalu and transfer back to your hotel by 1900 hrs.